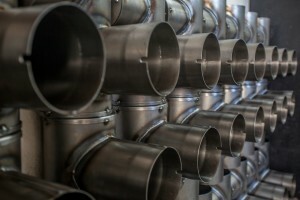 Stainless and acid-resistant flue systems are designed to carry exhaust gasses away from gas or heating oil fired heaters. Abiza boasts many years of experience in manufacture of such systems. Flue liner is made of stainless steel or special acid-resistant steel. We offer single layer flues – diameter range 80 mm do 500 mm – and flues with thermal insulation – diameter range from 100/160 mm to 500/560 mm. All tube sections are seam welded using plasma-arc technology. Individual elements are socket joined.